Party Photos from last Saturday and the fun pictures from the Earthshaker Fest. Have fun and tell me which you like. 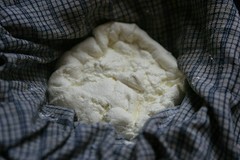 This week-ends cooking experiments included homemade ricotta. Via my favorite food blog chocolate & zucchini I found a recipe at 101 Cookbooks on how to make your own ricotta. And as opposed to some other things we tried this week-end it’s cheap and easy. I’ll experiment some more with this but it’s tasty fun and totally different from what they sell as ricotta in the grocery stores. 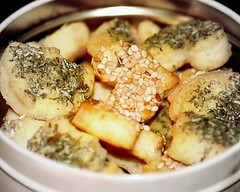 We also tried to make a gnocchi recipe from one of my Jamie Oliver cookbooks and failed miserably. We thought we’d done everything as it was supposed to be but they simply came apart into a mess, that was irrecoverable. Instead we made pasta with herbs and homemade ricotta + parmesan “topping” instead.Today I learned what might have been our mistake: the water should not have been cooking when we dropped in the gnocchi. Anyway next time we’ll try a more traditional recipe instead of one where the gnocchi consist mostly of ricotta (this was bought ricotta with a very very different flavor and texture …). This was the week-end of failed cooking: I also tried to make croissants and well … no croissants. Pretty nice “HÃ¶rnchen” though. When trying to fold the butter into the dough it kept shooting out for whatever reason … it probably wasn’t cold enough? Anyway I don’t need the exact “croissant”-texture to enjoy them. Bei Bestmalz gibt es was lustiges fÃ¼r alle Bier und Flash Fans: die virtuelle BrauereifÃ¼hrung! The booth can accommodate up to three people so you can shoot Prikura style video clips with your friends. Inside the booth is a fluffy thing called a MYSQ ring, you wear it on your hand. A camera detects the movement of your MYSQ ring. Also, floor sensors detect your foot movement. So, the system can control video effects based on your (and your friends’) hand/foot movement. I explain that I do it by turning the work into play. I make the job fun. I make it irresistibly exciting. I make it seductively challenging. I show how their part fits into and advances the whole. My employees then happily motivate themselves and don’t need to be bossed. I know the idea behind this. But but but …. I have yet to see proof that it works and find a boss that knows how to do this well maybe it’s not only knowledge that is required but someone who actually cares about the “manager” work they should be doing. I guess it’s the same way in that success motivates to continue. A little success every day can go a looong way towards creating bigger successes in the long run. Anyway today was the first day in a long long time that I was actually looking forward to the work I am doing. The reason? Well yesterday went pretty well and I managed to write some code, test it and see things fall into the place I had thought out for them before … I call that a small success. An added bonus: I only worked on one single project all day yesterday, no distractions! One of the ironies of consulting is that the goal of the consultant must be to make him or herself obsolete. You must so effectively transfer your knowledge and solve the client’s problem that they don’t need you anymore. But when a consulting firm scales up, their primary objective shifts away from providing value to the client towards providing consistent cash flow for the company. Meaning it’s free of any synthetic fertilisers, pesticides and or any other chemicals that are traditional ones used on golf courses. What’s more, the clubhouse restaurant lists a menu of organic beef, chicken, and herbs. Or feast upon oranges, lemons, limes, mandarins and grapefruits from the courses’s organic orchard. And if you need to take a load off your hind, then the compost toilets await your deposit, so they can feed any liquid nutrient back to the courses’s forests, via sand filters. So there’s clientele for that? Despite the title, I’m not dissatisfied with Google. Far from it. But I discovered a feature today that I’ve never seen before, and that I can’t find referenced anywhere. I don’t know if it’s brand-new, or if I just hadn’t discovered it yet. Sample link inside. A new google feature or old? If you were wandering around downtown San Francisco last Saturday you might have stumbled upon the Zombie Flash Mob. Every profession develops its own rules of thumb that everyone in that profession remembers, uses, applies, and heeds. List inside! And I’ll be thinking about this one all day.